(CNN) -- Most people have had dreams of flying. Graham Hawkes had dreams of flying -- underwater. The Deep Flight Super Falcon made its maiden voyage in San Francisco Bay in September. Hawkes has been in the business of building underwater craft for more than a decade. In the early days, his company, Hawkes Ocean Technologies, built vehicles for researchers and moviemakers. But in the past few years, the ultrarich have increasingly looked for cool playthings for their ocean adventures. Whoops. Did we say submarine? It's a submersible that can "fly" underwater. The Deep Flight Super Falcon looks like a fighter jet, with its thin body, two seats, two sets of wings and two tail fins. "We just had to tear up everything we knew about submersibles and start again on winged subs -- underwater flying machines," Hawkes said. He said Deep Flight submersibles are designed to be more agile than any creature living in the ocean -- with the exception of dolphins. The company says that because of the wings, the Super Falcon can go barrel-rolling with dolphins while traveling at speeds much faster than other private submarines. 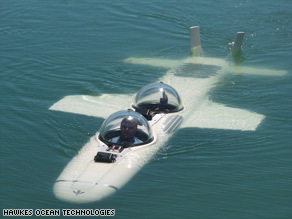 The craft can stay underwater for up to five hours and travel at speeds up to 6 knots, the company says on its Web site. The first client for the Super Falcon was venture capitalist Tom Perkins, who wanted a toy to keep on his mega-yacht, the Maltese Falcon. The base price: $1.3 million. Another model, which has open cockpits and cannot dive as deep as the Super Falcon, sells for $350,000. Perkins, writing in Boating International magazine, said he joined the project to take the Super Falcon from prototype to a fully functional craft. "Like some of my other projects, we didn't finish on time, but also like some of the others, the end result exceeded all our expectations," he said. The second machine is being built for Hawkes' personal use. A submarine driver wouldn't recognize the cockpit of the Super Falcon. "There are no valves, there are no gauges," Hawkes said. "You just power up the thrusters, start your take-off run, put the joystick forward, then the nose goes down. The wings literally pull it down." That's very different from conventional submarines, which basically dive by changing the ballast of the ship to make it sink. "It's not just that they look like airplanes, they actually are," Hawkes said. "The machines we build underwater should look like airplanes, not submarines. Airplanes don't look like balloons." He won't take credit for the idea, saying the idea of a submarine with fins and wings has been thought of before. The 1943 French comic book, "Red Rackham's Treasure," included a shark-like submarine with dorsal fins and a tail. Hawkes said that although the idea of wings may have been obvious, "The prize goes to he that does." On one of the submersible's first test voyages, Hawkes' team encountered a group of hammerhead sharks. The sharks were curious and swam around the watercraft. One engaged the sub in a game of chicken, only to veer off at the last minute. It was a great reward, Hawkes said. The craft is powered by batteries and the turbines that drive the ship were made with special care to be incredibly quiet. The maneuverability also lets it navigate in strong currents that stifle other underwater craft, the creators said. The business plan for Deep Flight includes schools for underwater pilots to fly future versions of the Super Falcon. The next school is scheduled for this summer in the Turks and Caicos, said Karen Hawkes, the company's manager of marketing and communications, in an e-mail. The three-day course costs $17,000. There is also a half-day, ride-along dive that costs $5,500. Karen Hawkes said the company enrolls 10 to 15 people per course and had open spots for this summer's courses. She also wrote that while "there really isn't something akin to the FAA governing submersible operations," her company thinks sub manufacturers should offer pilot training to the owners of machine. Then the owner can load his or her new toy onto their yacht and discover the underwater portion of this planet that most people never see, Hawkes said. "Do you want to stalk a shark?" he asked. "Do you want to go to a Great White and go woo-hoo? Do you want to do a barrel roll with a whale? "Shall we go and find some territories that humans have never seen before? ... Get in one of these machines, get below 150 feet -- the deepest that divers go -- and you are the first human eyes to look at that piece of the planet."